It seems like a silly thing for a beach lover and waterfall chaser to say, but there it is. I don’t enjoy swimming for swimming’s sake, but rather to cool off from the heat. I don’t love to shower, but I do it for obvious reasons. I hate getting caught in the rain, even when I’m properly equipped with an umbrella or easy escape route to someplace indoors. But as I typically do when I travel, I kicked off our trip with a “When in Iceland…” mentality. I knew I was going to get wet, and I consciously chose to embrace it. 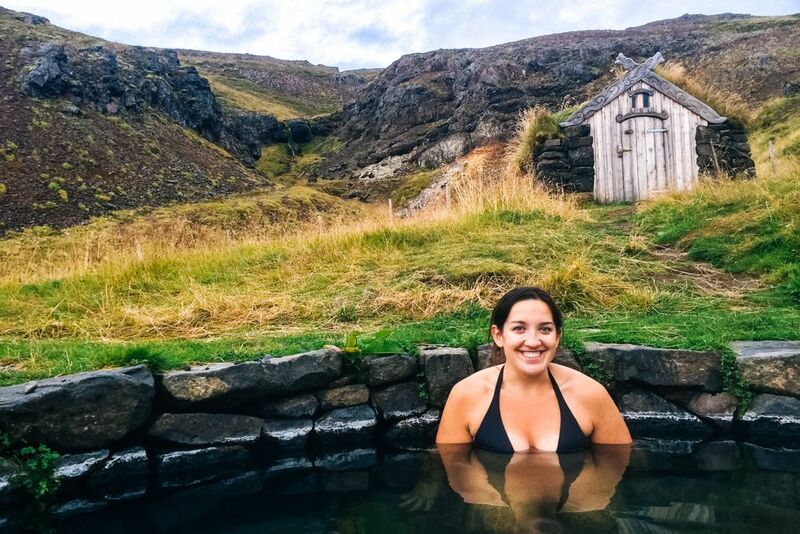 Rain gear was procured, swimsuits were packed – and most importantly, Iceland hot springs were researched. 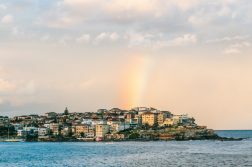 You wouldn’t think swimming would be a thing in a country generally equated with cold, rainy weather, but Iceland more than defies that assumption. 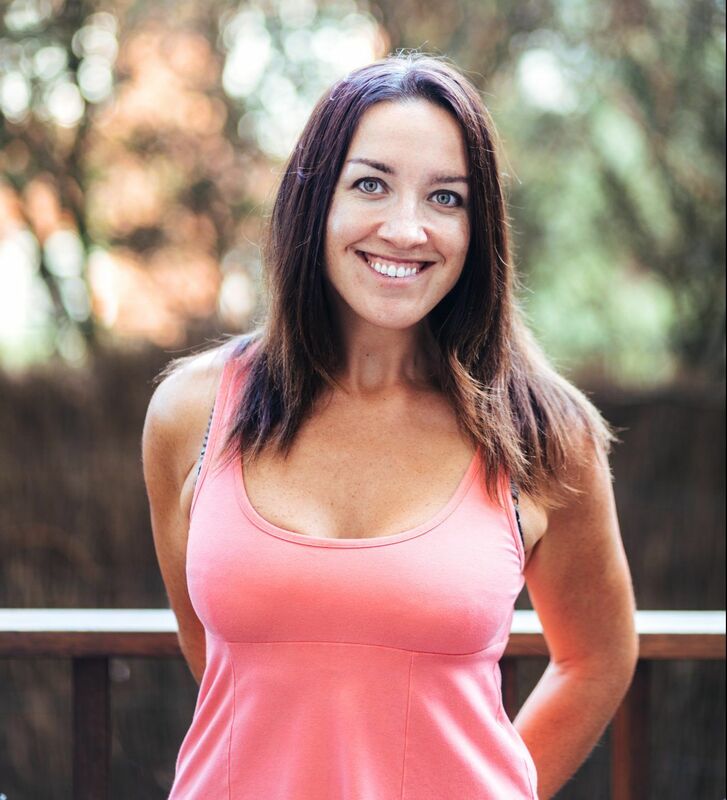 Most towns have a public swimming pool, often accompanied by a hot tub or two and even a waterslide – but c’mon, you know that’s not my style. Unless I’m smack in the middle of nature, specifically somewhere crazy beautiful, I have no interest in swimming. 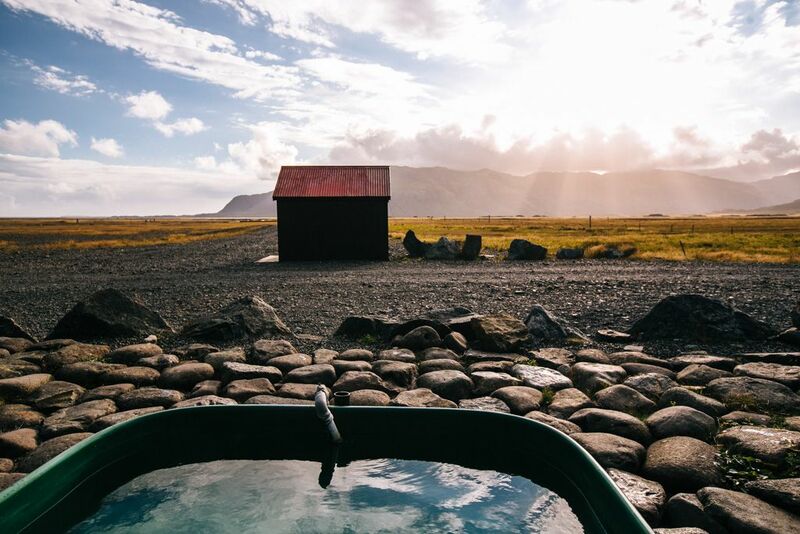 So instead, on my Iceland road trip I focused on uncovering the best hot springs in Iceland: seeking out little hot pools in Iceland stationed outdoors in places far away from the proverbial beaten path. 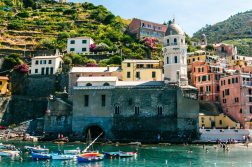 They require a bit of effort to find and trek to, and are frequented more often by locals than tourists. 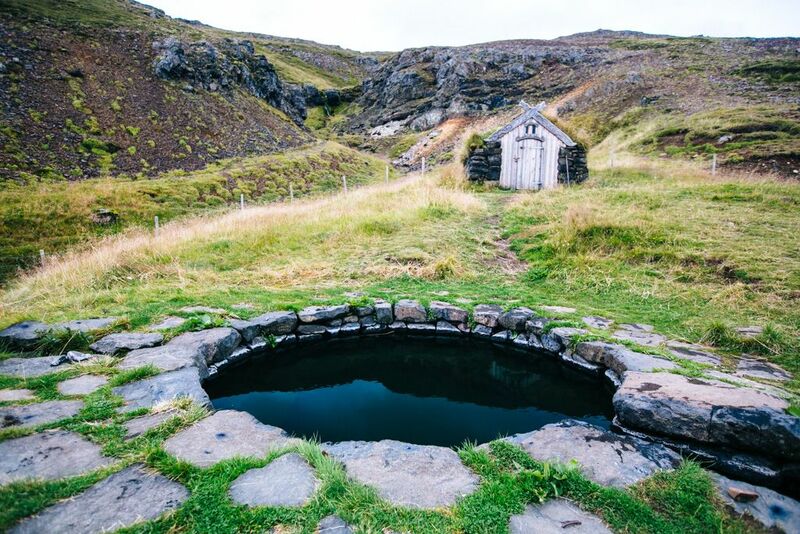 Some call for a small donation, some request that you shower before hopping in – but all of the Iceland hot pools are unique in structure and surroundings, which makes them such a joy to uncover. Even though it got a mention in the most recent edition of Lonely Planet, the hot pots in Drangsnes are more of a local hangout. Given that Drangsnes is a tiny town of less than 100 residents in the remote Westfjords, it’s not exactly a place tourists flock to when visiting Iceland. One of my favorite moments of the trip was soaking in one of the tubs here with a local family and learning about the country through them. There are 3 hot pots in Drangsnes: one is lukewarm, two are hot. All 3 sit just off the side of the road amidst the rocks leading out to sea with an unbeatable view. 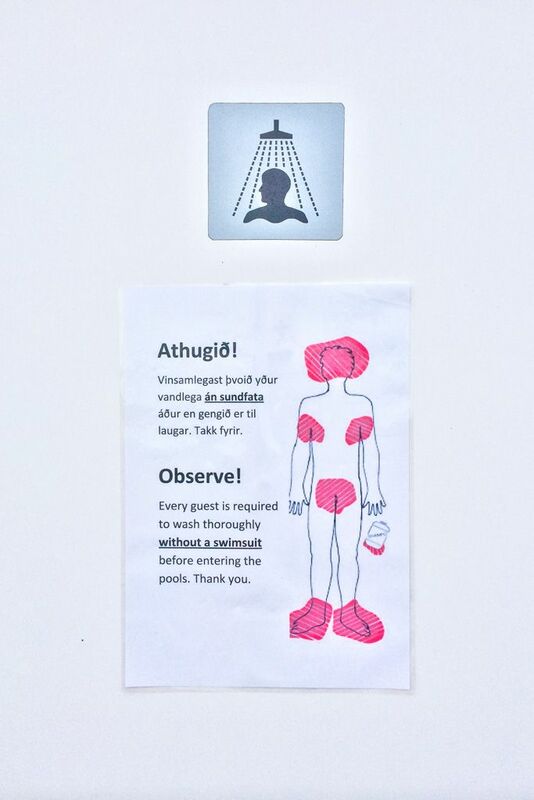 Right across the street is an impressively clean shower house where you’re requested to shower and soap yourself up sans bathing suit before entering these Iceland hot pools (ahem, see photo above). How to find it: Rt 645 will take you right through Drangsnes. The 3 hot pots are located right off the road on the seaside, across from a modern white church and a shower building (look for the swimming sign). 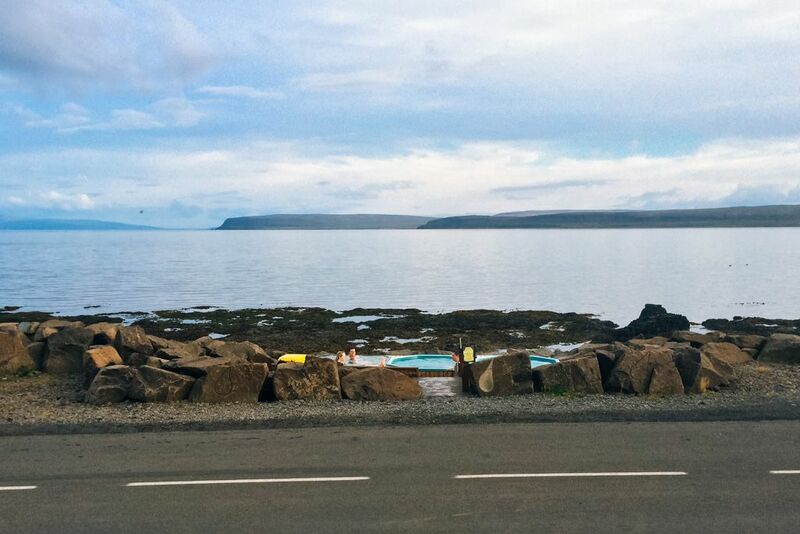 We came upon this pool quite by accident after a very long, very wet day traversing the Westfjords. 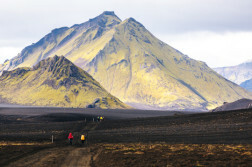 Lured by the 2500kr ($21 US) sleeping bag space promised at the Hotel Edda in Saelingsdalur, we rolled into the geothermal village of Laugar eager for an affordable and dry night’s sleep. Being able to relax that evening in a scenic hot pool in Iceland was an added bonus! Guðrún’s Bathing Pool is one of the nicer hot pools we encountered in Iceland, beautifully sculpted with stone and partially coated in green moss (which looks pretty cool, until you get in and see flakes of moss floating all over). This one was more warm than hot, but we were fortunate to have it to ourselves. It felt like elves could pop out from the surrounding hills at any moment, though! How to find it: Heading north on Rt 60, pass the left turn-off for Rt 590 and turn left at the sign for Laugar. 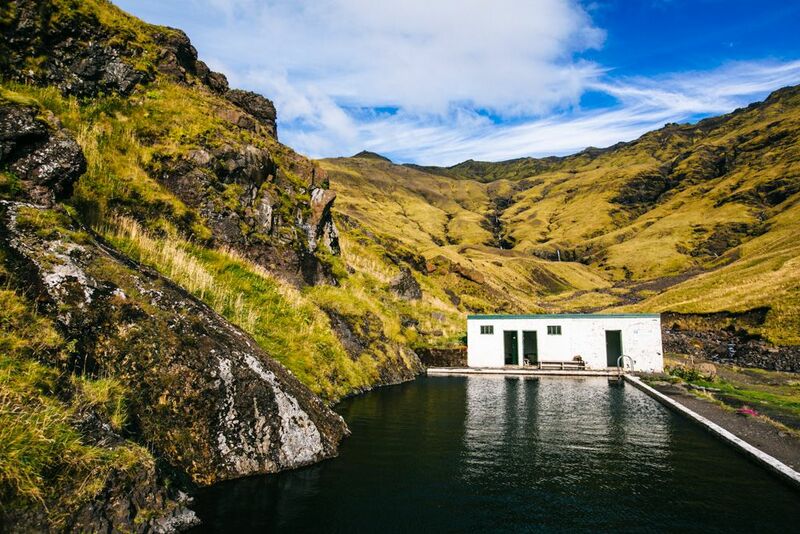 Guðrún’s Bathing Pool is located behind Hotel Edda and the camping area, toward the hill with waterfalls. It’s about a 100km drive north of Borgarnes. This spot came highly recommended from our glacier tour guide, and if there’s one rule I follow when traveling it’s always heed the advice of locals. Though the Hoffell Hot Tubs are situated right by the Hoffell Guesthouse, we were the only foreigners there. We snagged a hot pool and gazed out across the Icelandic countryside, late afternoon lightbeams streaming down from the mountains. It was fantastic. There are five Hoffell hot pots – two are warmer than the rest. You’re supposed to shower before tubbing, though your bathing suit can stay on for it. There’s also a donation box where you’re asked to leave 500kr ($4 US). Note: This is pretty much the only thing you will ever need cash for in Iceland: paying for pool access. How to find it: Hoffell is about a 25 minute drive west from Höfn. Turn off of Rt 1 at the sign for Hoffell, then drive another 3km on the dirt road. It will soon diverge into a few separate roads, and it’s not obvious which one to take to get to the hot tubs. Try to stay towards the center and look for a metal gate with a small parking lot. 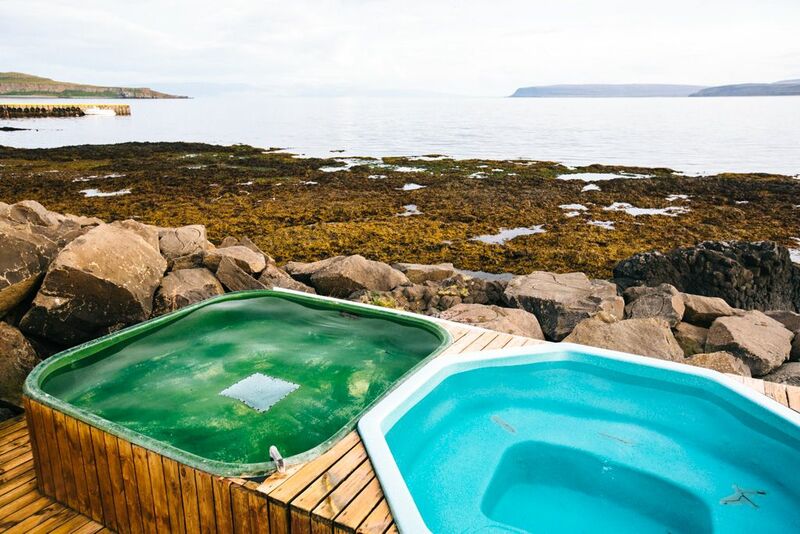 This hot pot in Iceland is a stunner. 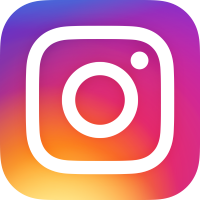 You’ve likely seen photos of it elsewhere on the web – and yes, it’s as beautiful as it looks! 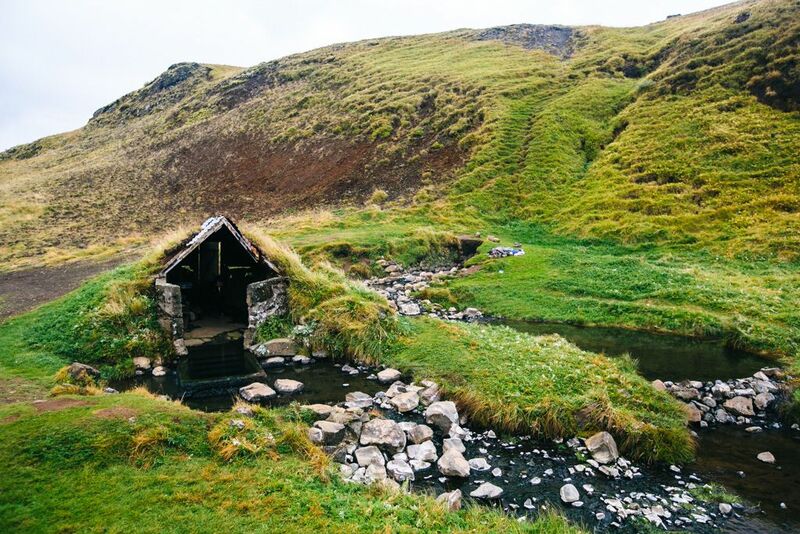 The Seljavallalaug Pool is warm but not hot, it has both a shallow and a deep end to swim in, and there’s an old hut for changing and hanging up your clothes. 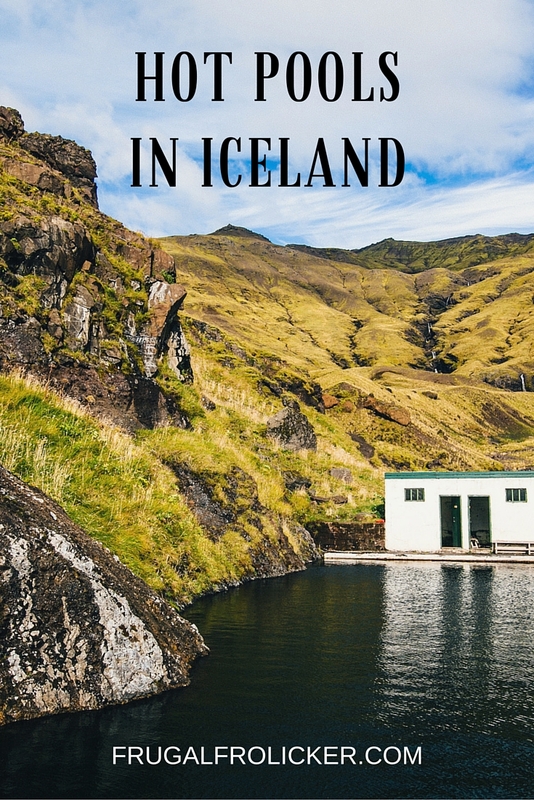 No shower, no fee, and just a two hour drive from Reykjavik – do yourself a favor and stop here if you make it to Iceland! How to find it: Off Rt 1, take Rt 242 inland and drive straight until you can’t go any further. There will be a small dirt lot across from a farm where you can park. From there, continue walking straight in towards the black dirt (not uphill into the woods) for about 10 minutes. I wasn’t entirely sure the Hrunalaug Hot Spring existed, at least not per our vague directions – but we managed to find it with little trouble. This one felt different from the other Iceland hot pools we visited, namely because it wasn’t a pot at all but rather a nook within a stream. We got changed in the cutest little stone hut built partially into a hill and, rather than join the other folks in the pool-like area behind it, stepped right out into the trough out front. It fit both Nicki and I perfectly, and there we sat, staring downstream whilst enjoying the hot (yes, it was pretty hot) water. Hot water, no shower, free – this spot is all natural, baby. How to find it: Rt 344 will take you to Hruni. As you enter town, there should be a small hand-painted sign for the hot spring. Just a bit further you’ll take a right, then find a little parking lot a minute later on the left. 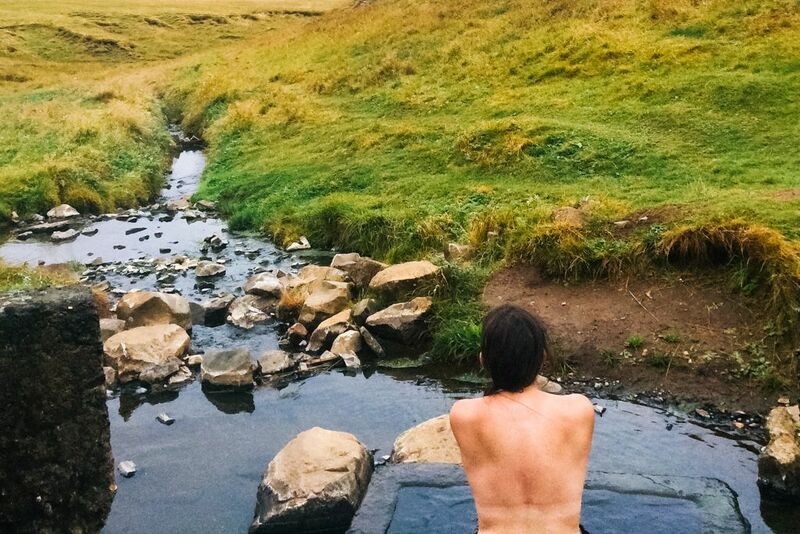 An easy walk over a hill will get you to one of the best hot springs in Iceland in about 5 minutes. What other hot springs in Iceland do you recommend checking out?